Mountain Medicine: For generations, wildcrafters have relied on the healing properties of our region’s diverse plant life. Today, Bent Creek Institute is using the tools of biotechnology to prove the value of these folk remedies and create a local hub for a new medicinal products industry. Long before aspirin stocked every home medicine cabinet, people in the mountains turned to the bark of the dogwood tree, which was prepared as a decoction to treat fevers. The twigs of the same tree where chewed to keep teeth white. To Ila Hatter, a longtime and respected wildcrafter, this is not news. She’s spent her life practicing folk medicine. “All plants have a benefit,” she says “whether to me, or the wildlife, or even the neighboring plant.” “Or,” she continues with a contemplative smile, “I just don’t know the medicinal value yet.” Hatter is part of the folk medicine culture of Southern Appalachia that is inextricably tied to the diversity of plants in our mountains. Once a part of everyday life, the practices began to slip away beginning in the 1950s, termed the decade of pharmaceuticals due to a great rise in the development and production of life-saving drugs. It was a time when home-remedy knowledge began to die out along with the families and local doctors who practiced it. During the last 20 years, though, there’s been a resurgence of interest in what plant-based medicine has to offer, as witnessed by the growth of the natural products industry. Bent Creek Institute, Inc., a four-year-old nonprofit housed on the campus of the North Carolina Arboretum in Asheville, is expanding on that folk knowledge with scientific research, proving that Western North Carolina’s biodiversity is one of our most valuable assets. With a greater understanding of that potential, the institute is laying the groundwork to build a home base for the conservation, research, farming, and manufacturing of medicinal plants. If successful, it will position the region as a player in a national $65 billion market. GERMINATION The institute’s start traces back to 1984, when tobacco, textiles, and furniture industries were declining in North Carolina and biotechnology became the buzzword for job creation. Governor Jim Hunt opened the North Carolina Biotechnology Center in the Raleigh-Durham area in hopes of stimulating the economy, and regional centers were placed across the state. At the time, Arboretum Director George Briggs feared WNC wouldn’t welcome biotechnology, which is broadly defined as the manipulation of life sciences for the creation of an end product. For many, it conjures images of GMOs (genetically modified organisms) and other controversial products. Briggs and the institute’s president, Greg Cumberford, then-vice president of Gaia Herbs, a natural supplements producer in Brevard, worked together to develop the alternative idea of natural biotechnology. Cumberford describes natural biotechnology as the use of sophisticated scientific tools to propagate cultivars and authenticate plants imported from abroad. It also refrains from genetic tampering to ensure a plant source is traceable to its original location. For WNC, an area already known for embracing a holistic lifestyle, this natural form of biotechnology seemed to be the right fit. Thus, Bent Creek Institute was founded in 2006, with funding from the state university system, among other organizations, and has since received support from Golden LEAF Foundation. At the core of the project is the Germplasm Repository, a department of the arboretum. The only one of its kind in North America, the repository is a seed bank designed to house a collection of medicinal plants found in the region with the purpose of conserving WNC’s botanical life. To date, 1,500 species on a target list of 2,000 have been collected and catalogued, according to Dr. Joe-Ann McCoy, director of the repository. But she says that number is “unstoppable,” meaning the collection efforts will continue indefinitely. Also on the list are rare species and plants threatened by climate change or development. McCoy and another staff member collect the specimens, traversing the landscape to harvest seeds, as well as log the locations of the plants with GPS coordinates. Back at the lab, volunteers clean and sort the seeds for storage, which, along with extracts, are available for collaborative research projects around the world. 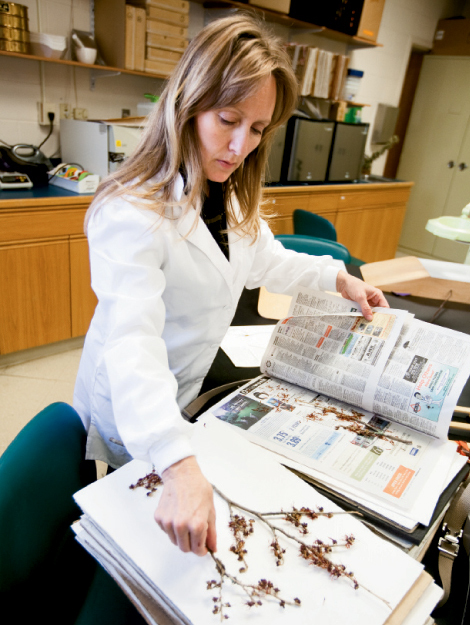 McCoy sites black cohosh as an example of how other sources are cashing in on plant research. This member of the buttercup family is a native North American plant used to treat hot flashes in menopausal women. Though McCoy has collected and preserved 20 local populations of cohosh for the seed bank, WNC has already missed an opportunity with this natural resource. A German-owned company, Schaper & Brummer, capitalizes on cohosh by exporting it and using it to produce Remifemin, a widely popular product sold for $15 to $25 a bottle. “We really missed the boat on that one,” McCoy says. “Why not grow, harvest, and brand our own product here?” It’s an economically important question she and the institute are working to answer. She is currently developing a regional cultivar of cohosh that farmers could grow here and sell, opening the door for a new type of crop. Other plants offer abundant opportunities as well. McCoy rattles off familiar names like ginseng, used by the Cherokee to relieve headaches, rheumatism, and colic, and spicebush, which Hatter employs to treat respiratory problems. “These are just a few of the plants growing here that we can now study, and start to create a place-based industry,” McCoy says. Growth Potential Still, there is much work to be done to become a contender in the natural products market. Educating growers about nontraditional crops, and teaching wildcrafters how to properly identify and document a plant species is vital. Wildcrafting—gleaning medicinal plants either for one’s personal use or sale—is still the primary way these plants are gathered, and sadly, sometimes poor harvesting or over-harvesting occur. For instance, while working with the Cherokee to develop a germplasm collection of edible plants, McCoy identified four populations of ramps in the spring. When she came back in the fall to harvest seeds, one of the populations was wiped out. “That’s 25 percent,” McCoy explains, “a large percentage of the whole.” As part of the education process, the institute is training wildcrafters how to create vouchers. These certificates document a plant’s roots, flowers, seeds, leaves, and stems with photographs. GPS coordinates are also recorded to identify where the plant was found, a factor which can influence a plant’s potency and chemical makeup. The vouchers are required to sell specimens to large companies, which must follow Good Manufacturing Practices (GMP), a quality system that governs drug development. If there is ever a question about a plant’s origin, the supplier’s voucher can be compared with the master catalog at the Germplasm Repository for verification of the species. Herbalist Patricia Howell, author of Medicinal Plants of the Southern Appalachians, is excited about the potential outcome. “Bent Creek will provide a way for herbalists to know the source of their material, and the assurance that it is collected or grown sustainably,” she says. Another piece of the puzzle is the manufacturing process, which is being facilitated by Blue Ridge Food Ventures on the Enka campus of Asheville-Buncombe Technical Community College. Started by regional economic development partnership AdvantageWest in 2005, BRFV recently added an 11,000-square-foot natural products manufacturing facility, which is available for rent to individuals and small businesses for the production and packaging of their products. If a grower of echinacea, a widely used herbal supplement, wanted to produce an extract for market, BRFV can walk them through the process. An on-site lab tests for quality, making sure each batch has the same strength of properties. The manufacturing section of the facility can bottle—complete with safety seals—and label the product. This ensures that GMP rules are followed, and produces a product consumers can trust. It’s also a boost for the small-business owner who cannot afford the overhead of their own facility. Helping entrepreneurs grow is one function of the institute, while attracting larger medicinal manufacturers is another. Both are necessary for the region’s economic growth. The institute is banking on the biodiversity of the region, combined with the programs already in place, to attract companies to the area. Their hope is that superior products based on solid scientific research will be enticing to producers. These collaborative steps are building a solid foundation for a medicinal hub, which the institute hopes will translate into jobs. Briggs sums it up best, “Western North Carolina is a special place. The biodiversity of our area, the four seasons, the beautiful mountains, the people…this is a chance to bring all of that together and create something to be proud of.” Sidebar: Into the Wild Early folk medicine practitioners believed that plants with roots resembling arms and legs held the most curative properties, therefore these plants were the most sought after. Ginseng (above) is a prime example. With roots that look like the form of a doll, it is one of WNC’s most exported and favored plants. It’s used to treat ailments ranging from dry cough to poor digestion and insomnia. The roots of lady slippers don’t look like limbs, but their blooms resemble shoes. Sometimes referred to as moccasin flower, this member of the orchid family is considered an excellent sedative with antispasmodic properties that alleviate insomnia and nervous tension. Some plants were tested as remedies because they stood out from the crowd. Joe-pye-weed can reach heights of 10 to 15 inches and grows along riverbanks and roadsides. The Cherokee used its hollow stems to blow air into herbal medicines, hoping to increase the potency through this method of activation. Today, the plant is noted as one of the most effect treatments for chronic urinary tract problems and also helps prevent the formation of kidney stones.